BA-50-05 Silver Organza Sheer Pouch. Drawstring close 3" x 4" 12 ct.
BA-50-11 Yellow Organza Sheer Pouch. Drawstring close 3" x 4" 12 ct.
BA-50-15 Gold Organza Sheer Pouch. Drawstring close 3" x 4" 12 ct.
Usually Ships within 24 Hours. Usually Ships within 24 Hours. Usually Ships within 24 Hours. BA-50-19 Red Organza Sheer Pouch. 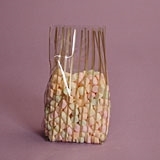 Drawstring close 3" x 4" 12 ct.
BA-50-21 Light Pink Organza Sheer Pouch. Drawstring close 3" x 4" 12 ct.
BA-50-31 Light Blue Organza Sheer Pouch. Drawstring close 3" x 4" 12 ct.
BA-50-59 Hunter Green Organza Sheer Pouch. Drawstring close 3" x 4" 12 ct.
BA-50-60 Purple Organza Sheer Pouch. Drawstring close 3" x 4" 12 ct.
BA-50-62 Navy Blue Organza Sheer Pouch. Drawstring close 3" x 4" 12 ct.
BA-50-94 Burgundy Organza Sheer Pouch. Drawstring close 3" x 4" 12 ct.
BA-10 Cellophane Gusseted Bag. 4" x 2 3/4" x 9" 100 ct.
BAP-01 Party/Celebration printed cello bag. 100 ct.
BAP-02 Gold Stars printed cello bag. 100 ct.
BAP-03 Silver Stars printed cello bag. 100 ct.
BAP-04 Red/White Hearts printed cello bag. 100 ct.
BAP-05 Groovy Hearts printed cello bag. 100 ct.
BAP-06 Easter Eggs printed cello bag. 100 ct.
BAP-08 Christmas Tree printed cello bag. 100 ct.
BAP-10 Snowman Family printed cello bag. 100 ct.
BAP-11 White Snowflakes printed cello bag. 100 ct.
BAP-12 Flower Power printed cello bag. 100 ct.
BAP-07 Merry Penguins printed cello bag. 100 ct.
BAP-14 Diagonal Stripe Red/Green/Gold printed bag. 100 ct.
Usually Ships within 24 Hours. Merry Penguins printed cello bag. 3 1/2" x 2" x 7 1/2" Quantity 100 Usually Ships within 24 Hours. BAP-15 Vertical Stripe Gold printed cello bag. 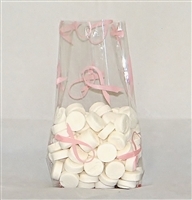 100 ct.
BAP-16 Hope Ribbon printed cello bag. 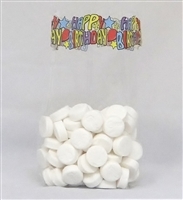 100 ct.
BAP-17 "Happy Birthday" printed cello bag. 100 ct.
BAP-13 Jack O Lantern/Pumpkin printed cello bag. 100 ct.
BAP-19 Santa's Treats printed cello bag. 100 ct.
BAP-20 Conversation Hearts printed cello bag. 100 ct.
BAP-23 Kids Safari printed cello bag. 100 ct.
BAP-24 Merry Ornaments printed cello bag. 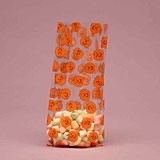 100 ct.
BA-60 Halloween printed cellophane bag. 100 ct.
BA-61 Confetti/Balloon printed cellophane bag. 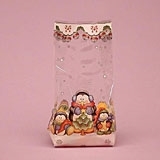 100 ct.
BA-06 Cellophane Gusseted Bag. 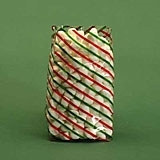 5" x 3 1/4" x 13 1/2" 100 ct.
BA-12 Cellophane bag. Gusseted with gold speckles 100 ct.
BA-90 1lb. Cello - Style Stand-Up bag, cardboard base. 100 ct.
BA-92 2lb. Cello-Style Stand-Up bag, cardboard base. 100 ct.
BA-93 3lb. Cello - Style Stand-Up bag, cardboard base. 100 ct.